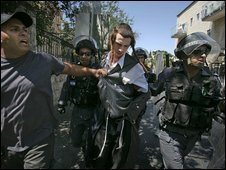 Ultra-Orthodox Jews in Jerusalem have clashed with police in protest at what they see as interference by the Israeli authorities in their community. Police said at least 28 people were arrested after protesters threw stones at officers and burned rubbish bins. Hundreds of police have been deployed - 10 were reported to have been injured. The incidents followed the arrest of an ultra-orthodox woman for allegedly starving her three-year-old son deliberately. The child is in hospital. The protests are taking place in two ultra-Orthodox neighbourhoods, Mea Shearim and Bar-Ilan. There were later reports of unrest in Beit Shemesh, a few miles outside Jerusalem, where police broke up a group of about 100 protesters attempting to block a road into the town. There were also reports of stone-throwing attacks on municipal workers. "Thousands of ultra-orthodox from the Mea Shearim district tried to close a main road to traffic, obliging law enforcement to intervene with water cannons," said police spokesman Shmuel Rubi. "Some police officers were hurt when stones were thrown" and police questioned dozens of people, he told the AFP news agency. 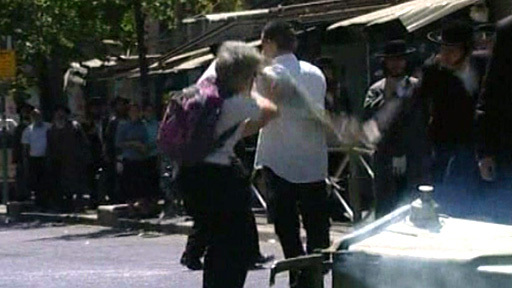 On Thursday, police used horses and water cannon to disperse the black-garbed Haredim. Police spokesman Micky Rosenfeld said the violence was "something that was not expected". Meanwhile the city's police chief, Aaron Franco, has said ultra-orthodox rabbis are not doing enough to denounce the violence. "It is time someone woke up because the violence threatens to cause victims," he said. Jerusalem is home to large Orthodox communities whose strict adherence to Jewish law sometimes puts them at odds with more the majority secular Jews. Anger is high at what has been seen as the "unjust" arrest of the mother, who is said to be suffering from a mental disorder. A hospital spokeswoman, Yael Bossem-Levy, was quoted by the Associated Press as saying the woman had Munchausen syndrome by proxy, a condition in which one person mimics or induces illness in another. Another current Haredi grievance has been the Sabbath opening of a private car park near the religiously sensitive Old City area, when Orthodox Jews abstain from work.